Neil is on a major deadline for a work project which has been consuming all of his time. He actually at work as I write this, it’s 6pm on a Sunday and he will probably be there for another 6 hours. This was our situation last weekend as well and every day this week he has been early to work, late to arrive home and after a quick dinner and story time he has been back to work. Needless to say we haven’t had a lot of family time and I haven’t had a lot of alone time to workout. Jogging Stroller. 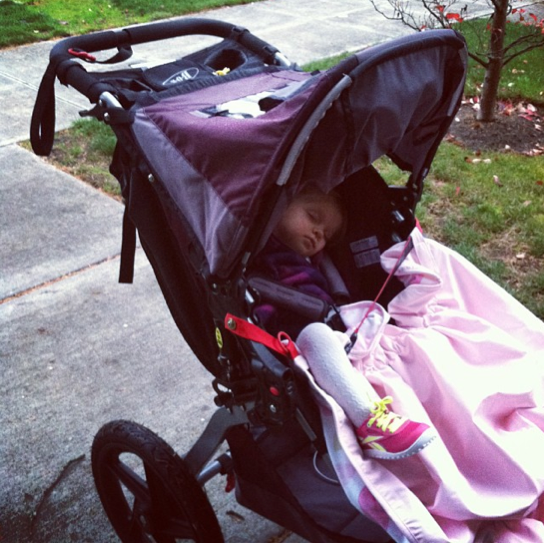 Seriously one of the best investments that we have ever made has been in buying our BOB jogging stroller. I use it at least twice per week to go out for a run with Edith (yay for being back in my running groove) and I often take her out at least one or two times for a nice long walk to the park. Babywearing. You might be scratching you head and saying really? YES! Caring around my 20lb toddler IS a workout especially when we get out for a 2-2.5 mile walk. The days of easy babywearing are over but I still love it. Chase The Toddler. This is a game E and I love to play. We head to the park and find a green area and I will run after her or circles around her and then come in for a big tickle session. I get my workout in and both of us get lots of laughing in. Stair Climbing. Literally. We have a set of stairs that goes up to our main living area and E will stand at the top and I will run up and down the stairs (17 stairs total in case you are wondering). I then reach through the gate and give her a tickle and she just laughs and laughs. Dance Party. When the weather is dreary we put on music and dance around the house. The best part is I can really get going and get my heart rate up just by having a 30 minute dance party with E. Bonus she generally sleeps better on dance party nights. Yoga Videos During Naps. I have tried to do other workout videos during naps but I often make a little too much noise but since yoga videos are generally calm and quiet I am able to do them during nap time. I am still trying to come up with some other ideas on ways to get workouts in while E is awake but so far I have a number of ones that work for me. That being said there are NO EXCUSES when it comes to getting at least four good workouts in per week. Are there obstacles or challenges that are getting in the way of your workouts? How do you or could you overcome them?